During the power wheelchair selection process, your therapist works with an Assistant Technology Professional (ATP) to decide which electric wheelchair and components meet your needs. When choosing a motorized wheelchair base, the drive wheel configuration must be considered. Front-wheel, mid-wheel and rear-wheel drive each have their own advantages and a user needs to consider his or her needs and how the electric wheelchair will be used when determining a drive wheel configuration. Front-wheel drive is extremely beneficial for many reasons. One of the biggest advantages is there is more force distributed to each of the four tires, because there are two fewer tires in contact with the ground, unlike with other drive wheel configurations. The greater force increases traction, enabling the front-wheel drive electric wheelchair to perform well when driving over soft terrain, grass or uneven gravel. In addition, the drive wheels are the first to encounter an obstacle. The large tires “grab” an obstacle like a curb or a step and go over it, pulling the rest of the chair with them. Another benefit of front-wheel drive is that a wheelchair user’s feet can be positioned easily because there are no front caster wheels on the motorized wheelchair. The user’s feet can be closer to his or her body for comfort. Plus, 90-degree footrests can be added. Front-wheel drive power wheelchairs have a lower seat-to-floor height. This allows wheelchair users to fit more easily under standard size tables and desks, enhancing their inclusion and social interaction. A front-wheel drive design is also beneficial indoors. It can easily navigate tight corners within the home. 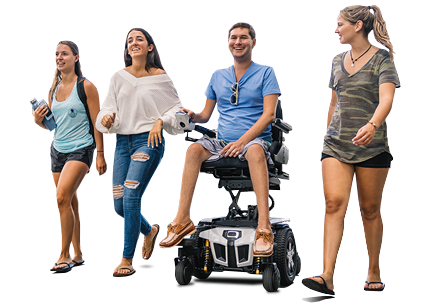 With so many advantages, front-wheel drive electric wheelchairs can truly benefit many individuals. If your therapist and ATP believe that front-wheel drive is a good fit for you, consider the 4Front® motorized wheelchair, which features a front-wheel drive configuration. This electric wheelchair is equipped with SRS (Smooth Ride Suspension) and CASE (Caster Angle Sensor Encoder) technology which provides stability during obstacle transitions. The 4Front is available with optional power adjustable safe seat elevation, enabling users to elevate up to 10 inches while driving up to 3.2 mph. In addition to greater stability and unmatched performance, the 4Front includes LED front and rear fender lights for added safety and drive wheel color accents for a touch of style.